Pigtails are short length 900-micron buffered fibers pre-installed with a connector at one end at the factory. These pigtails are spliced onto both tight buffered and loose buffered fibers in the field. This termination process is preferred by many installers either they find it the field termination of connectors a tedious process or they want to achieve extremely low-loss and high reflectance termination. 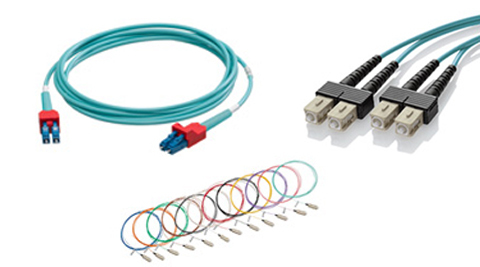 For completing the fiber optic systems connections, patch cords are used for interconnection or cross connection at telecommunications room and at the work area. cords are generally made at the factory with various combinations of fiber type, connector type and length of fiber cable. We have patch cords for every type of application. Multimode and single-mode cords are available in SC, ST, LC, or hybrid options, while secure Keyed LC Patch Cords provide additional protection from tampering. We also have MTP Array Cords for higher-speed 100G networks. Premium and Economy Series Patch Cords and Pigtails offer customers a wide selection, including options for higher performance, better pricing, and faster delivery times.